Anyone can use a mirror to snag a reflection. But every day, there are reflections going on around us, totally unnoticed. For this week's Shooting Challenge, capture one—without a mirror or glass globe, and no self-portraits! Capture a naturally occurring reflection in your environment (urban or wild)—that means puddles, store windows and shiny surfaces are fine. I just don't want any glass spheres, mirrors or similar crutch tools used. The reflection doesn't need to fill the whole frame, but it should be a subject in the photo. Oh, and you, photographer, should not be in the photo this time. That's part of the challenge. You know what really pisses me off in movies? Fake reflections—ones added by CGI. You have all this talent to capture a relatively understood phenomenon, and instead, a highly paid artist paints one in with a computer. Anyway! For your reflection, there are some good ideas to keep in mind. For one, keep your eyes peeled. You'd be surprised just how much a tiny puddle can reflect when you get close enough. Photographer Garry Black recommends finding a subject that's well lit and a reflector (a store window or a water source) that's in the shade. He also adds that you might want to underexpose the photo below your camera's meter reading—a half a stop to a whole stop—to black out the areas of the glass that lack reflection. Of course, Ira Fox takes some pretty incredible reflection shots....and I'm pretty sure that none of those just-mentioned shooting rules apply. 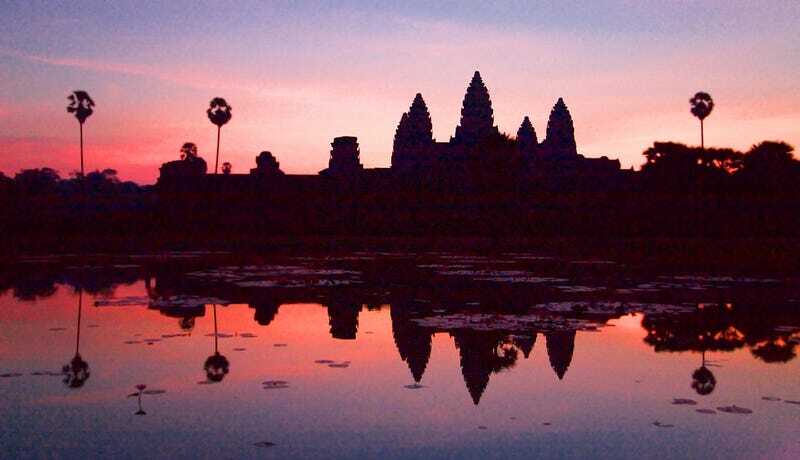 Our lead shot is by Chi King, of the Angkor Wat at dawn. Send your best photo by Monday, June 4th at at 10AM Eastern to contests@gizmodo.com with "Reflection" in the subject line. Save your files as JPGs, and use a FirstnameLastnameReflection.jpg (970px wide) and FirstnameLastnameReflectionWallpaper.jpg (2560px wide) naming conventions. Include your shooting summary (camera, lens, ISO, etc) in the body of the email along with a story of the shot in a few sentences. And don't skip this story part because it's often the most enjoyable part for us all beyond the shot itself!